Down to the British Film Institute to see, as part of the BFI's celebration of science-fiction films, the premiere of what was billed as a Polish science-fiction movie filmed in Iceland, but which turned out to be something completely different. 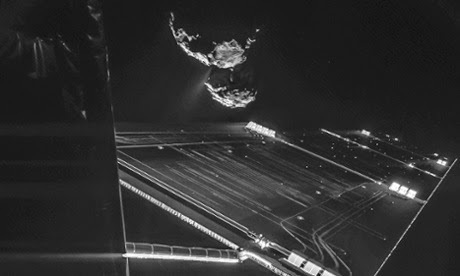 The European Space Agency commissioned director Tomek Bagiński to make a short SF film (link to YouTube because I can't embed it) to promote and celebrate the Rosetta mission to Comet 67P/Churyumov–Gerasimenko. The premiere was the unveiling of this hitherto secret project. A Master (Aiden Gillen) and Apprentice (Aisling Franciosi) in the art of world-shaping look back to the beginning of humanity's great expansion, and the first spacecraft to probe the mystery of the origin of the most essential element for life on Earth. It's a swift little parable, rich in CGI and making good use of Iceland's primordial terrain and some of the amazingly detailed images of the comet, and the fusion of SF speculation and an actual space mission is an interesting new direction. The showing of the film was followed by a presentation by some of the scientists involved, a short talk by science-fiction writer Alastair Reynolds, a brief panel discussion, and a reception where I was disappointed to discover that none of the drinks were fuming comet-wise. At the end of the 'Making of...' featurette, one of the pixel wizards who helped make the film muses that it's odd that the fantastic achievement of catching up with a comet, following it as it plunges sunwards from beyond Jupiter's orbit, and attempting to set a small spacecraft on its surface, needs a piece of fiction to catch the public's imagination. But what the film does is, like all the best science fiction, attempts to give the science - the vast distances, the mathematically precise manoeuvres and the alien cometscapes - a human context. It's a bit of a stretch to imagine that up the line, people will look back and pinpoint this particular mission as the hinge-point (especially as the brave little lander won't attempt its risky drift to the comet's surface until November, but given the mission's ambition, and its success at turning science fiction into the actual, this little bit of hubris is forgivable. It would be interesting, though, to try to frame the mission to the comet in a mundane, contemporary setting, rather than the abstraction of a free-floating far future. Its discoveries are, after all, adding to knowledge and speculation and wonder about the origins of the solar system and life on Earth right here, right now.